"Vinegar recipes that tickle the palate and nourish body and soul." Pour the Lavender Vinegar into a small saucepan and place on a very low heat to reduce gently for about an hour or until thick and syrupy. Do not let mixture boil as this will spoil the flavour. Cut the onions into wedges. Place these on a baking tray with the mushrooms, season and grill in the oven until tender. Cut the ostrich meat into one-inch cubes, pierce a hole through each cube and season with salt, pepper and paprika. Heat some oil in a thick-based pan and fry the meat to suit your taste. Bear in mind that ostrich meat has a low fat content and dries out easily, so medium is probably the best option. 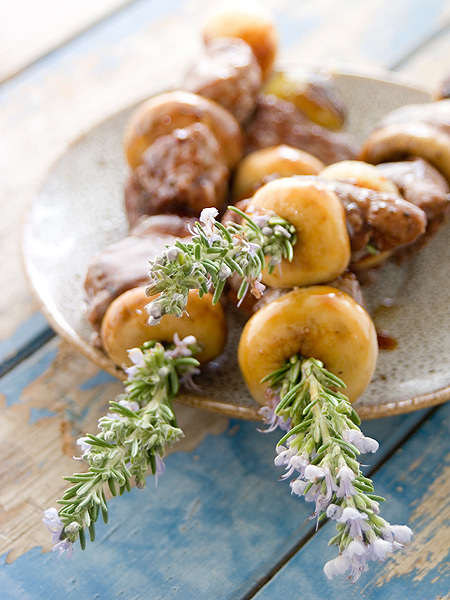 Skewer the ostrich, onions and mushrooms on the rosemary sprigs. Baste with the still-warm Rozendal Lavender Vinegar reduction and devour! Wash, core and halve the strawberries. Place them in a bowl with the pepper and vinegar. Lightly bruise the strawberries with a fork so that their juice blends with the vinegar. Leave to macerate for at least half-an-hour. Wash the lettuce and rocket and tear leaves into a salad bowl. 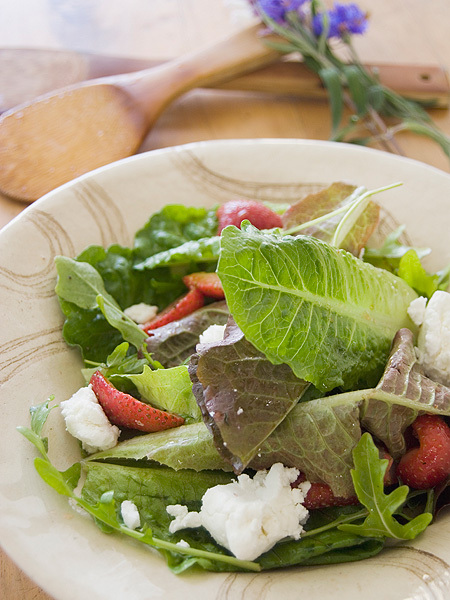 Remove the strawberries from the vinegar and add to the lettuce. Make the dressing by pouring the vinegar into a jar and adding salt and olive oil. Screw on the lid and give the jar a good shake. Taste the dressing and adjust the seasoning according to your taste. Pour the dressing into the salad bowl, toss to mix ingredients, then add the cheese. Enjoy outdoors under a shady tree with a glass of your favourite Chardonnay. Preheat oven to 180°C (350°F). Heat oil in a thick-based casserole. Season shanks and brown in oil. Remove meat and set aside. Add onions, carrots and celery to oil and cook over medium heat for five minutes. Add wine and vinegar to deglaze dish and simmer for five minutes. Put shanks back in and add tomatoes, rosemary, thyme, bay leaves, garlic bulb and plenty of black pepper. Add enough water or stock to just cover shanks. Cover dish, bring to the boil, then transfer to oven. Cook for 2 hours. Stir whenever you remember to ensure shanks cook equally. After 2 hours, remove dish from oven and gently simmer, uncovered, for 15 minutes. Add mushrooms and season to taste. Simmer for a further 15 minutes or until shanks are fall-off-the-bone tender. 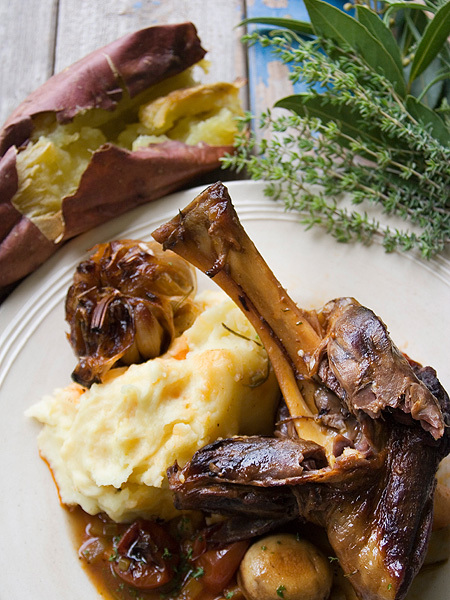 Stir in parsley and enjoy with creamy mashed potatoes or slow-roasted sweet potatoes. 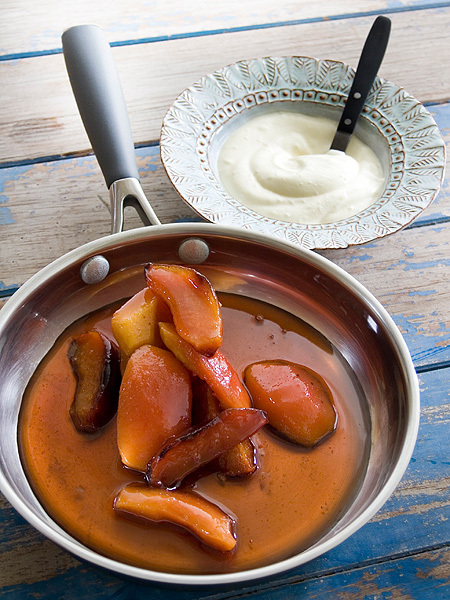 Divide into serving dishes and spoon over the golden pan juices. Serve drenched in fresh cream.